These Terms and Conditions (here in after - the "Terms") apply to all content on BookingCarCroatia.com website. Using BookingCarCroatia.com online booking service for car rental and car transfer you agree and accept the conditions, so please read them before using. BookingCarCroatia.com reserves the right to change the Terms at any time and such modification shall be effective upon posting on this Web site. Accept any future use of the revised Terms unless they are changed. BookingCarCroatia.com connects the service recipient with its partners, providers of rental vehicles at preferential rates of rent and do not own a vehicle or manages business partner car rental companies. All drivers must be aged between 21 and 75 years old. The minimum age for drivers is 21 years and a minimum of 2 years driving experience for car groups MCMR, EBMR, ECMR, EDMR, CCMR, CDMR, CLMR, CWMR, IDMR, IDAR, ILMR, IVMR, IWMR and ITMR. Vehicle management power above 80 kW (SDMR, SVMR, FDMR, FDAR, FFAR, FVMR, PDAR, Ptara, LTAR.) requirement is that the minimum age for drivers is 25 years and 2 years of driving experience. Cancellation is free of charge within a period of 2 days from the agreed date of hire. After the expiry of that period if the cancellation on BookingCarCroatia.com reserves the right not to refund the amount paid in advance for the costs arising due to the cancellation. In case the reservation is canceled within 48 hours prior to the designated start time of rental, or due to inability to pick due to incomplete or invalid documentation, not a valid credit card, not the arrival of the tenant on the agreed location, delivery vehicles, and the same type of cases on BookingCarCroatia.com reserves the right not to refund the amount advance for the costs arising due to cancellation. BookingCarCroatia.com not charge additional amendments in reservation to 48 hours before the start of rental, unless the change does not affect the amount of the total fees required to confirm your reservation. Rental period begins and ends with the date and time confirmed on reservation and under conditions that are approved by BookingCarCroatia.com. The costs and time is calculated based on the 24-hour unit. 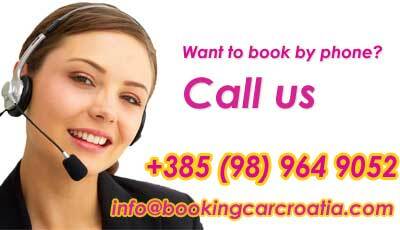 BookingCarCroatia.com reserved for you the best price and vehicle. There are no refunds for unused amount when the vehicle back earlier than the agreed date as on the reservation. If you want to extend the time of rental vehicles after the scheduled date of return or return later must contact the car rental clerk from whom you received the vehicle 24 hours before your scheduled return of the vehicle. Extension or delay paying host at his prices. At the time of pick-up of its user credit card guarantee for the new damage to the vehicle, unpaid parking fines, the cost of refueling and other charges in the amount specified for the corresponding vehicle group. The service provider shall be pre-authorized rental (reservation) amount by credit card, and the same will be made available to the user after the rental vehicle up to a maximum of 15 days. Deposit to the credit card option determines insurance is selected + amount for one tank of fuel. Deposit by cash, Maestro, Switch and Visa Electron debit card is not possible! The price of rental cars booked through BookingCarCroatia.com is always included only primary risk insurance automobile liability CDW (Collision with a deductible / excess) and liability insurance for damage caused to a third party. In this mode, the driver involved in the payment of the minimum amount of damage from € 1.600 to € 3.500 (franchise / excess) predicted for the booked vehicle group (SIPP code). Any new damage must be reported to the service provider and the clerk call the police at 112. This optional insurance does not cover damage to the wheels (tires, rims, wheels), underside (sump), glass and interior, lost or broken keys or contamination of fuel, neither in event of negligence or deliberate intention. BookingCarCroatia.com offers the option to include the option of booking their payments for super comprehensive insurance without excess (SCDW) for your rented vehicle. This option frees you from having to participate in the damage provided that you respect the general conditions of the rental agreement that you signed with the service provider. SCDW you pay extra for the service provider. SCDW not mandatory. If your vehicle is damaged and you have chosen the option of additional insurance SCDW sure to request a police report about the damage by calling 112, and for all other instructions, contact your service clerk from whom you received the vehicle. . This optional insurance does not cover damage to the wheels (tires, rims, wheels), underside (sump), glass and interior, lost or broken keys or contamination of fuel, neither in event of negligence or deliberate intention. All vehicles have to hire a full tank or fuel level indicated because the appropriate form. Preferably, the same amount and return, otherwise the service charge, which lacks the additional fuel and service for pouring fuel. The driver must always be informed of the fuel used by a vehicle that has been downloaded from the service provider. Damage resulting from filling the wrong fuel borne driver. Permission to travel outside the borders must be asked when you pick the car hire office and indicated on the rental agreement. Permission (CBC) for crossing the border must be paid directly to the service provider each day spent outside the country's borders. Andorra, Austria, Belgium, Bulgaria, Bosnia and Herzegovina, Czech Republic, Denmark, Finland, France, Germany, Great Britain, Hungary, Ireland, Italy, Liechtenstein, Luxembourg, Monaco, Netherlands, Norway, Portugal, San Marino, Poland, Romania, Serbia, Montenegro, Slovakia, Slovenia, Spain, Sweden, Switzerland, Vatican.